The Low Starch Diet is a prescribed treatment option for IBS. Irritable Bowel Syndrome (IBS) is a bowel disorder of the gastrointestinal (GI) tract resulting in recurring abdominal pain and discomfort, alterations in bowel function, diarrhea, constipation (or a combination of both), usually over long periods (months or years). IBS may affect as many as 20% of people in the UK at some time in their lives, and reportedly 10%-20% in the USA have been diagnosed with IBS. Females represent over 70% of IBS sufferers. Recent findings suggest that the colons of IBS sufferers react to stimuli that do not affect normal colons, and their reactions are far more severe – irregular or increased GI muscle contractions producing lower abdominal pain and cramping (often severe), extreme diarrhea and/or constipation, gas, and bloating. Irritable Bowel Syndrome is not the same as Inflammatory Bowel Disease (IBD), which refers to two chronic diseases causing intestinal inflammation: ulcerative colitis and Crohn’s disease, although IBS and IBD have some common features. 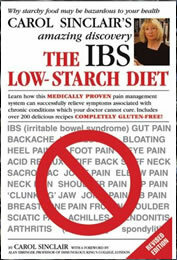 Carol Sinclair’s book The IBS Low Starch Diet details her years of struggle with IBS without any answers until she heard a doctor talking about the theory that among other chronic conditions, IBS was caused by food intolerance. It was stated that eliminating wheat flour from the diet could eliminate the symptoms! She promptly gave up wheat in her diet with immediate relief from her symptoms, and for about a year remained totally free from pain and bloating. When the symptoms returned, she set out on the task of identifying problem foods, spending many years researching and refining her diet as a virtual ‘walking laboratory’. desserts, baking, sauces, candy, relishes, drinks, snacks. Significantly, two recent developments have given impetus to the starch-free, or a low-starch, diet. There now appears to be a connection between IBS and the arthritic condition known as Ankylosing Spondylitis (AS) – diagnosed in 1 in 200 adults – with the discovery that IBS and AS are often the same autoimmune disease. Autoimmune diseases are chronic degenerative and/or inflammatory conditions resulting from abnormal immune reactions to compounds absorbed from the environment. One of the defence mechanisms of the body is to mount an immune response by launching antibodies against foreign substances in order to protect itself from potential harm. It does this by recognizing what is ‘self’ in order to respond to ‘foreign’. In autoimmune diseases there is a failure to recognise some part of self, with the result that antibodies attack the body’s own cells. This destruction may be restricted to a single organ, a localized region or the whole body. The consequences may vary from minimal to catastrophic, depending on the extent to which the body is affected. In the case of AS, it has been found that a particular bacterium normally resident in the digestive tract is the cause of AS in persons uniquely susceptible to the disease. Proliferation of the bacteria cause the immune system to manufacture antibodies, which help destroy the ‘invading’ substance, but appear to also attack body cells. So the bacteria are not the cause of damage to tissue, rather the body’s own defenses become the problem. A diet low in starch reduces the primary food source of this bacterium, lowering the population of the species in the digestive system, with marked beneficial results. The low-starch diet has been extensively and successfully employed in treating AS sufferers at the AS Clinic at London’s Middlesex Hospital. An Australian immunologist has discovered a link between starch foods that trigger, in people who have a particular gene (the HLAB27 gene), a range of symptoms such as gut pain, back ache, foot pains, eye pains, acid reflux, stiff back, stiff neck, sciatica, achilles tendinitis and frozen shoulder. It is possible that a simple blood test can diagnose your symptoms, and that a low-starch or starch-free diet may improve your health. What about starch foods in other IBS diets? The apparent paradox – soluble fiber is most important dietary aid for preventing Irritable Bowel Syndrome symptoms initially as well as for managing the symptoms of IBS. Soluble fiber prevents and heals diarrhea and constipation, unlike anything else. Since it dissolves in water and soaks up excess liquid in the large intestine it stops diarrhea, or cures constipation by softening faeces for a smooth transition through the colon. Trouble is, soluble fiber is NOT typically found in foods usually considered to contain fiber, such as bran or raw leafy green vegetables; this is insoluble fiber. Soluble fiber is found in starchy foods, though soluble fiber, but is different than starch because it can’t be digested by the human body. Soluble fiber passes through the human body without releasing calories. Insoluble fiber as well as fats stimulates the human digestive system and this of course isn’t good for IBS sufferers! But you can, and must, eat insoluble fiber foods, though always within the IBS dietary guidelines: never eat insoluble fiber on its own or on an empty stomach, but always with a larger quantity of soluble fiber, ensuring you cook, peel, chop, seed, dice, and/or puree all fruit and vegetables to remove the toughest insoluble fiber and break down the remainder before you eat it. So what about the starch in insoluble (therefore digested) fiber foods? At the top of the list are common foods that many can eat everyday and ones that most people have success with, but if you adopt the starch-free diet, check out how to remove starchy insoluble-fiber foods from your menu. Note that the recommended daily soluble fiber consumption for a ‘normal’ person is 5-10 grams. Sinclair, C. S. (2004). The Ibs Low-Starch Diet: Why Starchy Food May Be Hazardous To Your Health. Monica Reinagel’s Inflammation-Free Diet Plan. I am still incorporating what I learned in that (i.e. wild salmon is highly anti-inflammatory but farmed salmon is highly inflammatory) but I am also now including what I learned in another fantastic book – The Body Talks, Judy Cole. Cole explains in a really clear way how food is digested and used throughout the body. It strongly recommends eliminating food intolerances and following a low starch diet as the only way to heal your body (not just IBS and arthritis but also high blood sugar, headaches, psoriaris and other illnesses). This book advocates a similar diet to Sinclair’s but it explains all the nutritional science behind it – in a very easy way so we can all understand. From this I have been able to understand various foods (protein, fat, carb and starch) so that I can combine them correctly and healthily. i am diagnosed for Ankylosing Spondylitis (AS) and suffer from Chronic pain for last 10 years. Recently i learnt that starch free diet can help reduce the pain. Can someone pls advise a starch free diet list? Hi, if you read Carol Sinclair’s book there are some things in it that are not nutritionally correct (understandable since she is not a nutritionist). I suffer from IBS and Ankylosing Spondylitis and my nutritionist recently referred me to a book called ‘The Inflammation-Free Diet Plan’ by Monica Reinagel who is a nutritionist. It basically takes a far more detailed look at the idea of food causing inflammation and was a real eye-opener for me. You can read my summary on my blog http://www.bonappetitreview.blogspot.com. I’ve only been trying it for 3 days so it’s too early to know if it’s working yet!